Competition closes: 7 August 2017 at 23:59 Terms and Conditions Apply. 1.1. The Afternoon Express Dominoes: Unbreakable Spirit Book Giveaway Competition (Competition) will be run by Cardova Trading (Pty) Ltd in association with Brand Arc Media (collectively the organisers/we/us/our). Entries for the Competition will open at 16h00 on Monday, 7 August 2017 and will close at 23h59 on Monday, 7 August 2017 (Competition Period). 6.1. 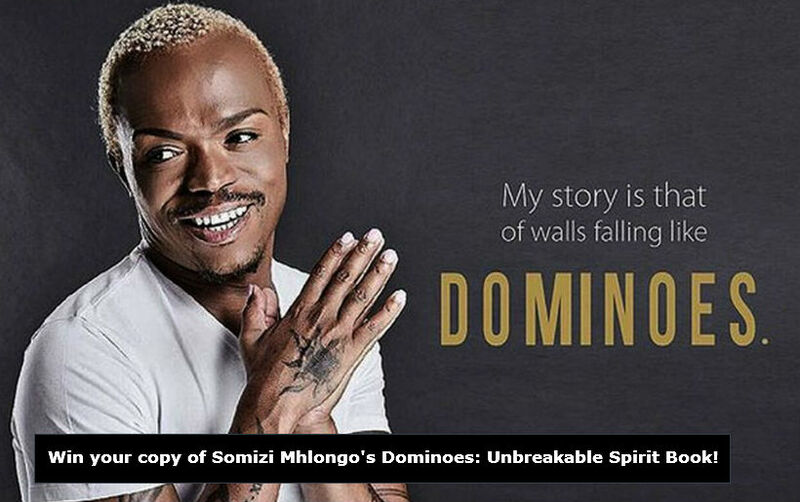 Each Winner will receive 1 (one) copy of the book titled, Dominoes: Unbreakable Spirit, written by Somizi Mhlongo & Lesley Mofokeng to the approximate total value of R 180.00 (one hundred and eighty rand) (Prize). 6.3. We will contact each Winner per telephone to obtain all necessary information to deliver the Prize and the Prize shall be delivered to the Winner at an address within the Republic of South Africa within 4 (four) weeks from confirmation of the Winner. 7.3. We reserve the right to amend these terms and conditions within the Competition Period should we deem it necessary in our sole and unfettered discretion.